Engaging quizzes, worksheets and tips to build safety skills in your group. Safety training doesn't have to be boring. These materials give you a lively, effective way to train your employees in key safety skills. Use these copy-ready pages for structured group training or casual one-on-one teaching. Put quizzes in your staff newsletters and give prizes to the employees with the highest scores. Combine pages to make custom workbooks. 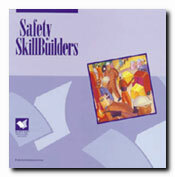 Safety SkillBuilders gives you lots of dynamic training possibilities. How Safe Is Your Attitude? What Do You Know About Confined Spaces? What's Your Fire Safety Rating? Fire Extinguishers: Do You Know Your ABCs? What Do You Know About the Hazard Communication Standard? What Makes a Chemical Hazardous? What Can You Learn from an MSDS? What Can You Learn from a Chemical Warning Label? What Can You Learn from an HMIS Label? What Can You Learn from an NFPA Diamond? Back Basics-How Much Do You Know? What Do You Know About Loading Dock Safety? Are You Plugged into Electrical Safety? What Do You Know About Machine Safety? Are You at Risk for Repetitive Motion Disorders? What Is a Defensive Driver? What Do You Know About Home Fire Safety? What's Your Swimming Safety Score? Anger Inventory What's Your Anger Style?